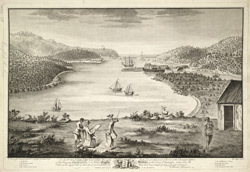 A view of English Harbour in Antigua, drawn by William Braiser. English Harbour was well protected by the mountains and nearby forts, providing a safe place for ships to be loaded and repaired. It was relatively small, but in 1672 the narrow neck of land separating it from Falmouth Harbour was cut through. Later, the harbour facilities were further enhanced by Horatio Nelson and it was used as a base for the Royal Navy. It was eventually closed in 1889.